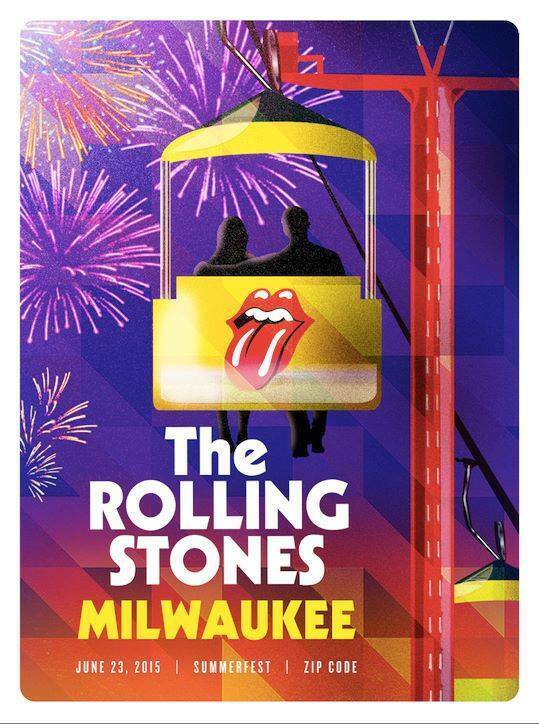 This thread is for live updates and comments regarding The Rolling Stones Milwaukee WI USA 23-June-2015 show. Please tell us your pre- and post-show thoughts and comments here. Milwaukee is on Central Time in America. Add 7 hours for Central European time, add 6 hours for UK time and so on. Edited 2 time(s). Last edit at 2015-06-23 17:53 by bv. Edited 1 time(s). Last edit at 2015-06-23 18:05 by Irix. Good luck to all The great Stones fans in Milwaukee. Looks like a great venue. I am sorry I did not go. Everyone, please have fun for me. I always get Satisfaction on the day of a show. The Stones will be joined by their friend Buddy Guy at Milwaukee's Summerfest! Is it mostly covered but technically open-air? Enjoy the hell out of it, either way! Red & yellow sections (Sec. 1-8) are covered. Bleacher benches & lawn...no cover. hey stonesfrk I forgot my phone - I'll call you when I get home - you will already be in the venue - it will be around 8:30 your time! Have a blast! Thanks, sweet neo. Does that mean the acoustics are a bit tricky, or no more than usual? I'm guessing she's not the media outlet's music critic. Edited 1 time(s). Last edit at 2015-06-23 19:18 by cmc. Edited 1 time(s). Last edit at 2015-06-23 19:43 by RS. at my office in Chicago, waiting for my ride. I go to so many shows...I never get excited like this for anything anymore, this is going to be one special night folks. 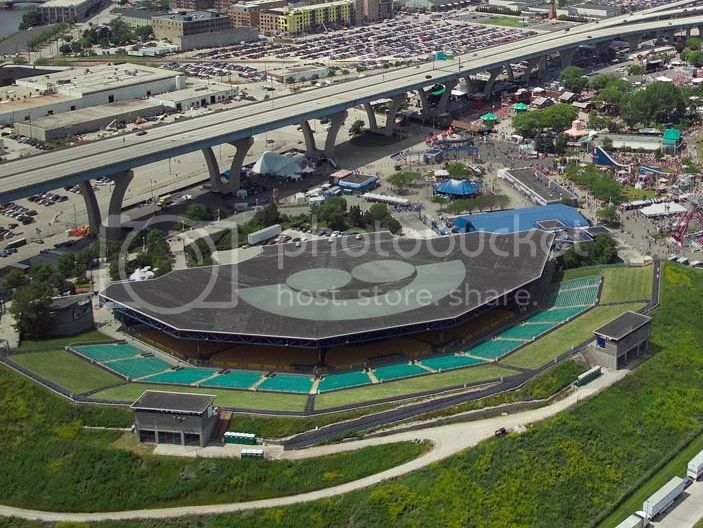 "So this is what the Marcus Amphitheater looked like yesterday -- with pit area"
Anyone interested in two face value section 3 tickets, see the All Sold Out page. Edited 1 time(s). Last edit at 2015-06-23 19:45 by sweet neo con. Have fun everyone! Enjoy the stones tonight. And Buddy Guy. Way cool! So do we already know how the seat numbers run, or does it vary from show to show? wondering which ones are seats 20-22. I know the fortunate occupants of those. So far I've met the following IORRIANS: latvianinexile, CMC, RS and Somestonesfan. (and I met MightyStork years ago) All great Stones fans and great people. I hope to meet more of you. this map does not show stage jutting into section 2. Edited 1 time(s). Last edit at 2015-06-23 20:05 by sweet neo con. Long time lurker, first post. Just a few things for our out-of-town visitors. We are in the peak of orange barrel season, and parts of your drive could get frustrating. Give yourselves plenty of time. Don't speed through Kenosha or Racine counties, they can be real pricks. Watch the signs, but moreover, watch the idiots. People drive like they're out of their heads here. DO NOT leave anything in your car, or at least in plain sight that you care about. Put your GPS, etc. in the trunk or under the seat. The parking lots will have No Security. Beer will be about $7 a cup, water about $3 a bottle. Tailgating is recommended. There should be some good food options on the grounds. Keith and Ronnie will be the only two exempted from the no smoking policy, although there are smoking areas outside of the pavilion. The weather will be PERFECT! It will be a little cooler by the lake at the end of the night, so a light jacket may be in order. Welcome to Milwaukee! Enjoy your stay! And the show! Austrianstones - my phone won't let me call you. Please call me. I am in downtown Milwaukee.